Why be happy with finishing your climb at Col des Mosses (1445m), when you could continue up to another nicer pass from the parking on the northeast side of Col des Mosses? This last section is on a road with some concrete pavement and some asphalt and it is sometimes easy and sometimes steep. 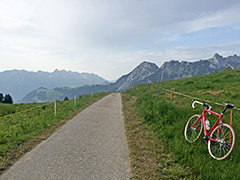 The climb from Aigle (417m) should be the most consistently hard climb up here. If coming from Col de la Croix (1776m) or Col du Pillon (1546m) you can start at Le Sépey (1077m) or take the nice little road over Les Voëttes and start at 1110m. Or you can start in Les Planches if coming down from La Forclaz (1261m). You can also start the climb in Châteux-d’Oex (902m) or Les Moulins (890m) and go via Col de la Lécherette (1389m) and then take off at the parking just before reaching Col des Mosses (1445m). You can also take a small road from Montbovon (798m) via Allières (with maybe a short stretch of gravel) to the Hongrin dam to La Lécherette (160m shorter than via Les Moulins, but with 94 hm instead of 46 hm extra). Other comments It is quite beautiful up at the pass and also nice to go to the Les Brenlaires (1674m) near the pass, which also looks like a pass (just as another place on the other side of the Pra Cornet), but the man living there only thought of Col des Mosses as a pass (but locals are sometimes wrong). Anyway these two passes have likely not been used much as passes and I see no path down from Brenlaires (unlike Le Soere), which is why I do not list it even if asphalted. See also Col de la Pierre du Moëllé (1661m).